Elephant Mountain (象山, Xiangshan) is Taipei's most popular hike, especially for tourists. It's short, well paved, easily accessible from Taipei's most popular district (around Taipei 101) and most importantly it offers postcard views of the Taipei Cityscape. If you're not a professional photographer camping out with your full-length tripod, or students on a date, you'll be in a tiny minority. Elephant Mountain makes a worthy alternative to a trip up Taipei 101. It trades the world's fastest elevator with your own legs, but it's not a long or strenuous walk to the main viewing platform. It also trades gem shops with trees, and huge crowds of tourists with smaller numbers of tourists, students and professional photographers. While it doesn't offer the 360 panorama of Taipei 101, it instead offers a perfect cityscape view with Taipei 101 in it. To reach Elephant Mountain take the Tamsui-Xinyi (red) line to Xiangshan Station (the last stop on the red line, one after Taipei 101), and then walk through the pleasant Zongqiang Park. 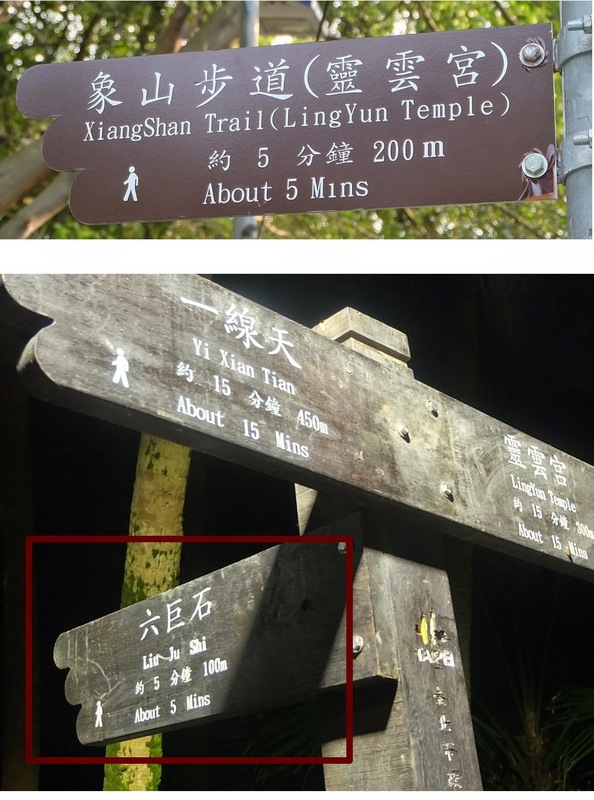 Follow signs to the Xiangshan Trail. At the first fork in the path take the right path to Liu Ju Shi (六巨石). After approximately ten minutes you'll pass between several large stones and what appears to be a small viewing platform but is actually a grave, with a sign requesting people not to stand on it. The observation deck is just up and around to the left from this site. Most people visit for the Liu Ju Shi viewing platform (below) however there are interesting trails, and temples large and small all over the mountain. From the fork (described below) the left path follows along the mountain and offers comparable views of the city, with several deserted picnic tables. The nearby Heavenly Treasure Sacred Path Temple (天寶聖道宮) features a giant god built into the mountain. These other trails are not lit up, so it's important to bring a torch and watch out for the many resident frogs along the paths.